If you have grown beyond the basic free website for your affiliate marketing needs, it is time to start thinking about upping your game. Taking your website to a custom domain if you haven’t already, and considering a hosting account that can grow with your audience. The more views you have, the more computing power you will need in the future. Look at these tips for choosing the best WordPress hosting for your website. Your budget is going to play a big factor in your choice for WordPress hosting. There are many different types of hosting platforms tat range in monthly or yearly pricing. Before you jump into a hosting plan, consider how you plan to grow in the coming months or years. Do you plan to add more websites? Are you sticking with a single site only? When you decide on this then start considering a monthly budget for your needs. Some WordPress hosting plans like the one from MediaTemple allow for 100 websites on a single account. The price is roughly $20.00 a month. 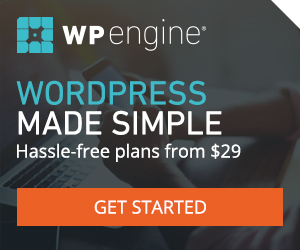 On the other hand, if you plan to only have one site, I recommend considering a dedicated WordPress hosting platform like WPengine. They offer a single install and many features to make sure your website can scale with the traffic. Either way, make sure to have a plan before jumping into an account. Migrating WordPress websites can be a bit tricky, but not impossible. Reliability and server uptime will play a large part in how often your website is being seen by viewers. You want to make sure to find a hosting platform that is reliable and always live. Keep in mind, all platforms have server maintenance and unforeseen issues that come up. Do your research on the hosting company and see what other businesses use the same platform. Sometimes your favorite blog or website will have a small link at the bottom to the hosting provider. This is a great way to see who other people trust in the industry. This website is proudly hosted by MediaTemple. I asked this above, but plan or map out your business for the next year. Some WordPress hosting accounts like the ones available from MediaTemple allow for multiple installs of WordPress. I can host 100 websites on a single account. I have used this account to host freelance projects for small to medium businesses with no issues. If you are only looking to have one install or one website, then you should be good with most plans. I tend to create micro-sites for different promotions and niche websites so I want plenty of room to grow. Internet traffic is a funny thing. One minute you can have 100 users, and then suddenly a viral post sends thousands of users to your website. Even though this kind of traffic boost is rare for new websites, don’t count it out. It could happen if you’re lucky. When it does happen, make sure your hosting account can scale to meet the demand of your traffic. Some WordPress hosting accounts can scale and even out traffic among different servers. This is called load balancing. You don’t need to get too technical with this issue, but you may want to ask about it with the representative if you plan to send high amounts of traffic from the start. Depending on your website, you need to consider how much storage space you will be needing. Do you plan to host videos and large media files? This can make a difference in how big your website can grow over time. Many WordPress hosting providers offer scalable packages, but just be sure the scalability also includes more storage. You don’t want to be paying for storage al a cart if you plan to frequently upload large data files. Not a day goes by that websites are not being attacked in one form or another. Many hackers try to get access to servers to inject virus code into websites. Check into the data security and server security of the hosting provider. Many use enterprise class security software to keep your data and your customer data safe. Smaller hosting providers may only do scans weekly, while others run them multiple times a day. I just advise to do your research based on the type of data you will be collecting with your website. This one feature has saved my websites multiple times. When I first began building WordPress websites, I would break the WordPress code frequently (I was learning at the time). Until I got smart and started using data backups and more efficient plugins. At the time, the best way to restore a website was to get the hosting provider to restore the last backup of your files. This feature may cost you extra, but I am sure it will be worth it. It will give you the peace of mind to know your data is being saved multiple places. Shared hosting is when your website is hosted along with many others on a single server. This server is partitioned to handle many websites and usually is cheaper to get started with. You will be sharing hosting space with other websites. Don’t worry, they can’t access your content. This is more of an industry standard practice for hosting accounts. Dedicated Hosting is a pricier option, but allows for the most flexibility with the server itself. Dedicated hosting allows you to lease a single or multiple servers for your business use. These are usually top tier packages and come with dedicated support for your development. I don’t thing many people will need this option, but it is available if you have the budget for it. If you are interested in a certain hosting company, do a quick search on YouTube for them. There is a great chance that someone has created a tutorial or walk-through with the interface. You want to see how easy or user-friendly the interface is so you can find what you need. You won’t be able to really get a feel for the interface and menu until you start an account, but this will give you a quick glance at the back end if you want to learn more. Some hosting interfaces are more complex and allow for more control. Some are for built with the user in mind and try to keep it simple. Have a WordPress or server issue? Who do you call? Many hosting providers have great back office account support. Many provide FAQ sections or support sections with thousands of questions everyone has asked before. If you can’t find the answer your looking for, you want to make sure the hosting provider has an easy accessible contact number for you to reach out to. I made many mistakes early in my career, and I have had to work with hosting providers to restore backups of files. Therefore I am telling you to consider the customer support of your provider. They need to be trusted partners for you and your business. For professional businesses and custom needs I am recommending the following hosting providers. They are pricier then your regular hosting accounts, but they will get the job done, and customer service will be there to meet your needs. If you are just starting out, and you only need limited hosting power but want to make sure you are with a professional company, here is a quick list of top providers. Many of these offer very budget friendly WordPress hosting plans for you to get up and running quickly. There are many other factors that you could consider when researching managed WordPress hosting providers. These key factors will get you started, but you will need to determine your own custom needs, and work with your provider to make sure you are being covered.